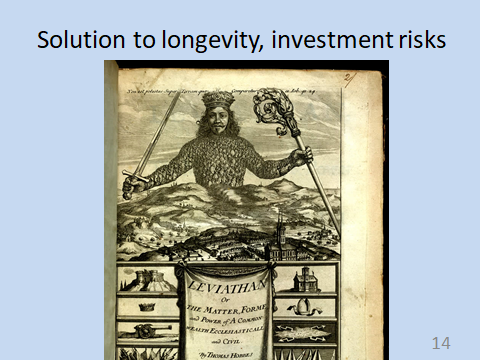 Please click this link for slides of a presentation about USS to members of my UCU union branch. * They include my take on USS’s proposed valuation (slides 2–3), the merits and feasibility of First Actuarial’s response on behalf of UCU (slides 4–5), the futility of a rise in employer contributions to save our pensions (slide 6), the inevitability of a reduction in the strength of our DB pension promise (slide 7), the proposed employer cuts to our pensions that we can expect (slide 8), the bad value for money of our employers’ preferred IDC replacement for DB (slide 9), and, finally, a way to preserve our pensions: First Actuarial’s WinRS proposal (slides 10–12), which it’s worth going on strike to achieve, as the best feasible means of preserving pensions payments at their current level (slide 13). WinRS has the strong backing of Terry Pullinger, Deputy General Secretary Postal of the Communications Workers Union (CWU), and has been embraced by his union in their dispute with Royal Mail. CWU was one of the earliest backers of Jeremy Corbyn and has recently affiliated with Momentum. There is another closely related approach to collective pensions provision, involving targets rather than promises and known as collective defined contribution (CDC). Nobody else in this country has done more than Kevin Wesbroom, who is one of Aon’s two actuarial advisers for our employer (UUK), to advance the case for CDC. 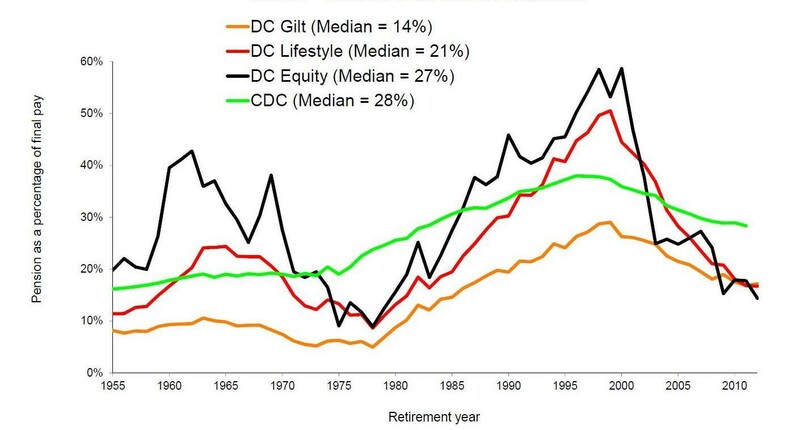 The green line in the graph below captures Wesbroom’s modelling of how CDC would have performed historically in comparison with a DC lifestyle approach (red line) along the lines of USS’s default DC pension fund. Wesbroom et al, ‘The Case for Collective DC’ (2013), p. 40. So there is a convergence of expertise and support among the actuaries for UCU (First Actuarial’s Derek Benstead and Hilary Salt) and UUK (Wesbroom) for a design for collective pensions involving targets.